Psst! I recently stumbled upon this new mobile application - Giftblob. Sending a gift via mobile sounds too good to be true? But, that's the truth that Giftblob promises you! (ﾉ´ヮ´)ﾉ*:･ﾟ✧ Being me, I love the idea of sending gift at anytime I wish and it always makes me happy to see my friends happy! 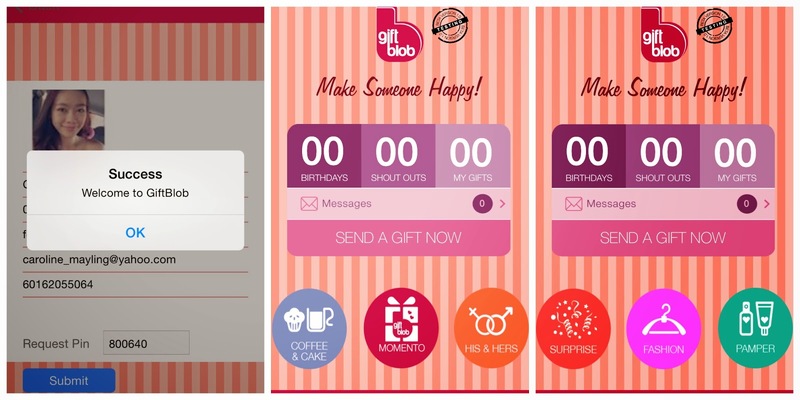 Giftblob, is probably one of the best apps that you will ever own that entitles you to make your special ones happy without you going through a hassle to do so! Let me tell you how and why. After few simple steps of signing in and getting your pin, you're good to go. As you can see, you can choose from six different categories and then select your preferred gift away - Coffee & Cake, Momento, His & Hers, Surprise, Fashion and Pamper. It takes 3 simple steps to send a Gift to your loved ones. It is connected to Facebook, which reminds you of your friends' birthdays and such other important events. The Gift available in "Momento" can be delivered directly to your loved ones' doorstep. Click "SEND A GIFT NOW"
At your discretion, your friend will be notified of the Gift via email or Facebook message. Easy huh? What are you waiting for? Download Giftblob and start sending gift away to surprise that special someone today!